When we are exhausted, depleted, and on the edge of burn out, we need to have our souls restored! But who can restore our souls? 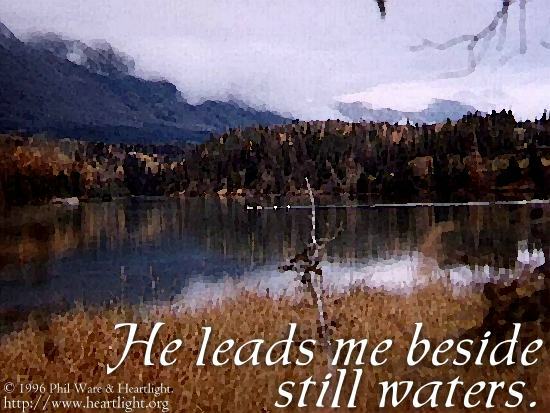 Only the One who will lead us beside still waters! The Lord is our Shepherd. He alone can fully bring the nourishment and replenishment that we need. Yet why do we sometimes find it so hard to set aside time to be with him? Could it be that we keep our lives so busy that we miss out on the one thing that matters most? As you have shown me time and time again, dear Father, I know that being with you restores me in a place within my heart that no one else can reach. Forgive me for seeking nourishment and refreshment from places that are unholy and unhelpful. Reinvigorate me with your presence and power so that I can serve you more victoriously. In Jesus' name I pray. Amen.